All previously reported eukaryotic nuclear genome sequences have been incomplete, especially in highly repeated units and chromosomal ends. Because repetitive DNA is important for many aspects of biology, complete chromosomal structures are fundamental for understanding eukaryotic cells. Our earlier, nearly complete genome sequence of the hot-spring red alga Cyanidioschyzon merolae revealed several unique features, including just three ribosomal DNA copies, very few introns, and a small total number of genes. However, because the exact structures of certain functionally important repeated elements remained ambiguous, that sequence was not complete. Obviously, those ambiguities needed to be resolved before the unique features of the C. merolae genome could be summarized, and the ambiguities could only be resolved by completing the sequence. Therefore, we aimed to complete all previous gaps and sequence all remaining chromosomal ends, and now report the first nuclear-genome sequence for any eukaryote that is 100% complete. Our present complete sequence consists of 16546747 nucleotides covering 100% of the 20 linear chromosomes from telomere to telomere, representing the simple and unique chromosomal structures of the eukaryotic cell. We have unambiguously established that the C. merolae genome contains the smallest known histone-gene cluster, a unique telomeric repeat for all chromosomal ends, and an extremely low number of transposons. By virtue of these attributes and others that we had discovered previously, C. merolae appears to have the simplest nuclear genome of the non-symbiotic eukaryotes. These unusually simple genomic features in the 100% complete genome sequence of C. merolae are extremely useful for further studies of eukaryotic cells. The biological sciences have been embracing a new paradigm as a result of accruing genome information [1–13]. However, all previously reported eukaryotic nuclear genome sequences have been incomplete, especially in highly repeated units and chromosomal ends. Because repetitive DNA is essential to genome function , and may contribute to the diversity of isoforms  and the evolution of life , complete chromosomal structures are fundamental for understanding eukaryotic cells. Our recently published nuclear-genome sequence of the ultra-small, hot-spring red alga, Cyanidioschyzon merolae 10D, revealed some unique features, such as very few introns, only three copies of ribosomal (r)DNA, and a small total number of genes [9, 10]. However, because uncertainties remained regarding the features of certain important repeated elements, such as histone-gene clusters and telomeres , this sequence, like all previous eukaryotic nuclear-genome sequences, was incomplete. Given the functional significance of such elements , it was obviously desirable to complete the sequence and resolve all ambiguities before attempting to summarize all of the unique features of the C. merolae genome. Therefore, we aimed to complete all previous gaps and sequenced all the remaining chromosomal ends, to construct the first nuclear genome sequence that is 100% complete. The results demonstrated that C. merolae possesses the simplest nuclear genome known among non-symbiotic eukaryotes. Completing the nuclear genome sequence, from telomere to telomere, without gaps or ambiguities, required two distinct subprojects: (i) filling in all 46 previously existing gaps between contigs, and (ii) sequencing the 34 (of 40) chromosome ends that had not been sequenced previously by the shotgun method . Using PCR with sequence-specific primers to amplify portions of the C. merolae bacterial artificial chromosomes (BACs) that contained gap regions of interest, and then sequencing the resulting subclones, we have reduced the number of gaps between contigs from 46 to zero (Figure 1). A variety of methods (Additional files 1, 2) were then used to sequence all of the chromosomal ends that had not been sequenced previously (Figure 1). The global size of the 46 gaps that we have sequenced in this study is 46 469 base pairs. These sequences are G+C-rich (61%) compared with that of the whole nuclear genome (55%), and six of the 46 have extremely high G+C contents (70–76%). Furthermore, sequences corresponding to 13 previous gaps have extremely high nucleotide identity (99.4–100%) to other genomic regions. It turns out that the nuclear genomic sequence previously reported  contains misassembled and/or incorrect sequences of >20 kbp in total. The resulting complete genome sequence contains 16546747 base pairs and covers 100% of the chromosomal genome, from telomere to telomere. The numbers of base pairs in each of the 20 nuclear chromosomes are given in Table 1. These 20 linear nuclear chromosomes plus the two circular organellar DNA molecules [17, 18] comprise the entire genome of the organism, and contain 16728945 base pairs (Table 1). Bird's-eye view of the 100% complete structures of 20 C. merolae chromosomes. This shows regions that were filled in the present study ('Gap' and 'Chromosomal end'), telomere repeats, the histone cluster area, localization of transposable elements ('Class I' and 'Class II') and putative centromeric regions . *Based on the present 100% nuclear genome sequence. The total number of histone genes varies greatly by species. Animal genomes typically have several hundred to several thousand histone genes organized as a set of tandemly repeating quintets of the five major histone gene types [19, 20]. In contrast, histone genes are located on more than one chromosome in some organisms, such as the ultra-small green alga Ostreococcus  and the flowering plant Arabidopsis . In our previous study, the complete organization of the histone cluster area in the C. merolae genome was left unresolved, because of several gaps within this region of sequence . However, our present complete sequence establishes that all C. merolae histone genes are localized on chromosome 14 and form a small cluster (around 48 kbp long) that includes two copies of the three core histone genes (H2A, H2B and H4), three copies of the H3 gene, and a single copy of the linker-histone H1 gene (Figure 2). In Saccharomyces cerevisiae , Schizosaccharomyces pombe , Dictyostelium discoideum , Encephalitozoon cuniculi  and Ostreococcus tauri  the histone genes also exhibit small copy numbers (up to three), as in C. merolae, but they are dispersed across more than two chromosomes. Thus, the C. merolae histone genes are present in the most compact cluster yet described. Strategy for finishing the analysis of the C. merolae histone gene cluster on chromosome 14, and a map of histone genes resolved within the cluster. The black and the white squares in genes represent CDS and 5'-/3'-untranslated regions, respectively. H4-a, histone H4-a; H2B-a, histone H2B-a; ADF, actin-depolymerizing factor; S/TPK, RIO-like serine/threonine protein kinase; 40S-S13, 40S ribosomal protein S13; H3-b, histone H3-b; PTR, possible transcribed region; H2A-b, histone H2A-b; H3-c, histone H3-c; TIM50, mitochondrial preseqence translocase subunit Tim50; BAT, brabched-chain-amino-acid transaminase, mitochondrial precursor; H1, histone H1; ASM, similar to N6-adenine-specific methylase; Hyp, hypothetical transcript; TPR, hypothetical protein, conserved (containing tetratricopeptide repeats); CAB-CP24, similar to chlorophyll a/b-binding protein, CP24; H2B-b, histone H2B-b; Hyp, hypothetical protein; H4-b, histone H4-b. Whole-genome shotgun sequencing suggested that the repeat unit in C. merolae telomeres is AATGGGGGG , but in that study only six of the 40 chromosome ends were examined  (Figure 1). Here the sequencing of all remaining termini confirmed that AATGGGGGG is the telomere repeat sequence in all C. merolae chromosomal ends. In most plants, the telomeres are composed of many copies of the sequence TTTAGGG , and the C. merolae telomere sequence, AATGGGGGG, has never yet been found elsewhere. Telomere length varies among plants from approximately 0.5 kbp in the green alga Chlorella vulgaris to 150 kbp in tobacco [22, 23]. Telomere restriction fragment analyses using the (CCCCCCATT)3 probe revealed AATGGGGGG repeats varying from 400 to 700 bp in the total chromosomal ends in the C. merolae genome (data not shown). Our Southern blot analysis using a specific genomic probe suggested that C. merolae chromosome 15 has around a 400-bp telomere repeat sequence at the left end (see Additional file 3). However, the longest telomeric repeats that could be sequenced in this study were 2.5 repeats (AATGGGGGGAATGGGGGGAATGGG) in the right end of chromosome 1, possibly because long stretches of AATGGGGGG repeats are difficult to clone or sequence using conventional techniques used in this and previous studies . The putative telomerase catalytic subunit, telomerase reverse transcriptase (TERT) is transcribed (CMD110C) in C. merolae . In the C. merolae genome, we found two possible telomerase RNA subunit genes in chromosomes 13 and 16, based on two transcripts, CMM123T and CMP131T, which included UUCCCCCCAUU and CCAUUCCCCCCAUU sequences, respectively. The telomerase RNA template sequence (CCCCCCAUU) has been detected in only these two hypothetical non-coding RNA genes among all the predicted genes in the present 100% complete nuclear genome. These are the first convincing candidate telomerase-RNA subunit genes in plant and algal lineages. 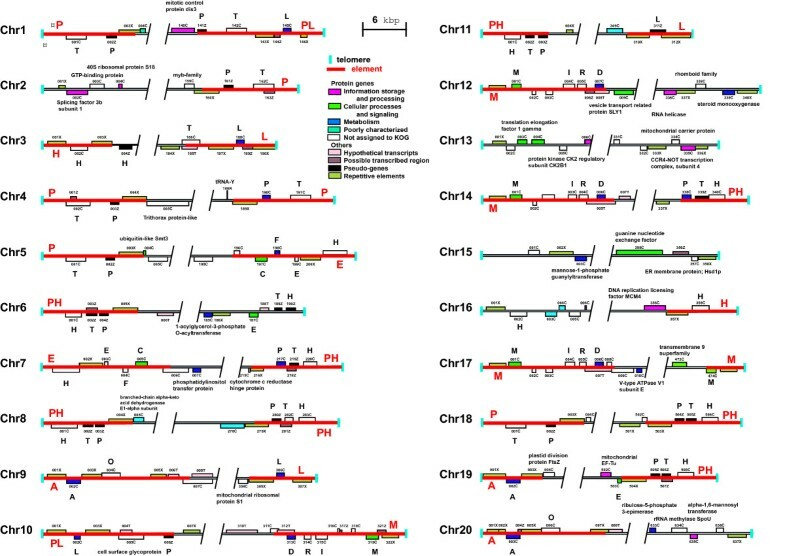 Based on the end sequencing of all 40 chromosomal termini completed here, all of the subtelomeric regions in the C. merolae nuclear genome have been unveiled (Figure 3). Eight types of homologous DNA elements (up to 20 kbp), with unique gene contents, were found adjacent to the telomere repeats in the 40 chromosomal ends (Figure 3). Two of the eight types exist in only two ends; element H for 3L (left end of chromosome 3) and 16R, and element L for 3R and 11R. PH elements are the most frequent and are recognized in 6L, 7R, 8L, 8R, 11L, 14R, 18R and 19R, whereas nine termini (namely, 2L, 6R, 12R, 13L, 13R, 15L, 15R, 16L and 20R) showed no homology to other terminal regions. This situation is different from that of S. cerevisiae, in which core X elements exist in all chromosomal ends . In the ultrasmall, obligate intracellular parasite E. cuniculi (Microsporidia)  and the nucleomorphs (the reduced nuclei of the eukaryotic endosymbionts) of the cryptophyte Guillardia theta and chlorarachniophyte Bigelowiella natans [25–27], both of the subtelomeric regions of all chromosomes harbor rRNA genes. However, such features are not recognized in Cyanidioschyzon (Figures 1, 3) and the ultra-small green Ostreococcus , and thus seem to represent some evolutionary convergence resulting from the intracellular parasitism or endosymbiosis in E. cuniculi and the nucleomorphs. Complete gene contents at the terminal regions of C. merolae chromosomes. T, P, L, H, C, F, E, A, O, D, R, I and M represent genes for the trefoil factor, NADPH:protochlorophyllide oxidoreductase, L-lactate dehydrogenase, hedgehog protein, subunit 6a of chaperonin containing TCP1, subunit ATP5 of F1FO ATP synthase, ubiquitin conjugating enzyme E2, copper-containing amine oxidase, anion transporter, dTDP-glucose 4,6-dehydratase, dTDP-4-dehydrorhamnose reductase, iron permease, and dolichyl-phosphate-mannose:protein mannosyltransferase, respectively. Detailed information is available on the C. merolae Genome Project website http://merolae.biol.s.u-tokyo.ac.jp/. Homologous DNA elements are shown as red lines with designations. The number of transposable elements in various eukaryotes differs widely [28–30], and of all the non-symbiotic and non-pathogenic eukaryotes previously studied, yeast and pufferfish have the fewest: about 3% of the genome [29, 30]. However, transposons constitute only about 0.7% of the C. merolae genome (by assuming that the average gene size of RT- and transposase-related elements are 4 kbp and 3 kbp, respectively). The completed C. merolae genome sequence contains only 26 class I elements (retrotransposons) and eight class II elements (transposons)  (Figure 1). The transcripts of three of the 26 retrotransposons contained an intact reverse transcriptase open-reading frame, and a BLASTX search suggested that all 26 of the retrotransposons were most closely related to non-long terminal repeat (non-LTR) retrotransposons. So, although LTR retrotransposons are widely distributed in plants and animals , we could not find any of them in the C. merolae genome. All eight of the transposase-related elements of C. merolae were most closely related (E-value = 0.071–6 × 10-7) to transposase sequences of bacterial transposons. In short, C. merolae is one of the two non-symbiotic eukaryotes with an extremely low abundance of transposable elements (Table 2). In the endosymbiotic reduced eukaryotes, Encephalitozoon cuniculi and nucleomorphs [5, 25–27], however, transposable elements seem lacking in chromosomes. Comparison of the nuclear genomes of Cyanidioschyzon, Ostreococcus (an ultra-small green alga), Arabidopsis (a flowering plant) and Ashbya (a filamentous fungal pathogen). Bold type indicates the smallest number in non-symbiotic eukaryotes. Two non-symbiotic eukaryotes, Schizosaccharomyces pombe and the filamentous fungus Ashbya gossypii, have nuclear protein-coding genes that are as small in number as those of C. merolae. The number of protein-coding genes in the nuclear genome of S. pombe  increased to 5004 http://www.sanger.ac.uk/Projects/S_pombe/genome_stats.shtml. Although A. gossypii was reported to contain 4718 protein-coding nuclear genes , the genome project of this fungus is now in progress http://agd.unibas.ch/; thus it possibly contains more than 4775 protein-coding genes. In contrast to this, 253 copies of a novel interspersed repetitive element were found in the C. merolae genome. All copies have a truncated ORF that is weakly related (BLASTX E-value = 10-5-4 × 10-2) to a putative protein, WSV486, that is encoded in the genome of the shrimp spot syndrome virus . These repetitive elements have an average size of 3.2 kbp, are distributed randomly on all chromosomes, and altogether comprise about 5% of the genome. Because these elements exhibit transcriptional activity , they may contribute to genomic or cellular functions in C. merolae in the same manner as repetitive DNA does in other eukaryotes . The smallest known histone-gene cluster, a unique telomeric repeat, a very low density of transposable elements, and other previously described simple features of the C. merolae nuclear genome [9, 10] (Table 2) are very distinctive, and constitute the simplest set of genomic features found in any non-symbiotic eukaryote yet studied. Such simple features are generally considered to result from consequences of reductive evolution of an ultra-small eukaryote . However, none of these features is shared by the similarly ultra-small green alga, Ostreococcus, in which 39% of the genes contain introns, histone genes are dispersed across at least six chromosomes, and 417 transposable elements and 8166 protein-coding genes are distributed among the chromosomes  (see Table 2). These may suggest differences in modes of genome reduction between ancestors of Cyanidioschyzon (red algae) and Ostreococcus (green plants). On the other hand, algae living in acidic hot springs (pH 1.5, 45°C) might be candidates for retaining ancient plant attributes, because the volcano activity is thought to have been providing such an extreme environment throughout Earth's history. Very recently, Cunningham et al  reported that C. merolae contains perhaps the simplest assortment of chlorophylls and carotenoids found in any eukaryotic photosynthetic organism. In addition, the C. merolae plastid genome contains a large number of genes, which is thought to be a primitive feature, because reversal of plastid-gene loss is generally considered to be impossible [34, 35]. Thus, our hypothesis is that some of the unusual or simple genomic characteristics of C. merolae may represent primitive features that have been conserved in Cyanidioschyzon, but have become extensively modified during the evolution of other plant lineages. Alternatively, the unique genomic features of C. merolae (Table 2) may reflect adaptation to the extreme environment. However, genome information for other hot-spring red algae is very limited. The recently released nuclear genome sequence of another hot-spring red alga Galdieria has not revealed the chromosomal structures of its components, such as rDNA units or histone cluster area. . Further information on the complete nuclear genomes of other plants, including other hot-spring red algae, red macro-algae, and other members of plant and algal lineages, will be needed to determine whether C. merolae actually has primitive genomic features. Three kinds of genomes are found in many eukaryotic cells: nuclear, mitochondrial, and plastid . Based on the present nuclear genome data and the previously published mitochondrial and plastid genome sequences [18, 19], all major types of eukaryotic genetic information are present in C. merolae. In addition, as revealed by the present 100% complete genome, C. merolae contains unusually simple sets of genes and sequences (Table 2). For example, because almost all protein-coding nuclear genes of C. merolae lack introns (Table 2), the complete sequence of the genome provided here can be used directly to deduce the sequences of all of its proteins, which will make it extremely valuable for future proteomics research. Therefore, C. merolae represents an ideal model organism for studying the fundamental relationships among the chloroplast, mitochondrial and nuclear of genomes. The complete nuclear genome sequence reported here will greatly improve the precision of biological analyses of C. merolae, including studies of chromosome structure and gene structure/annotation. Furthermore, because C. merolae inhabits hot springs (45°C) , most of its proteins must be unusually heat-stable, and so its proteome may well provide important new insights into the structural basis for heat stability of proteins. Previously constructed C. merolae BAC clones  were used for filling in previously existing gaps between contigs. PCRs of BAC clones containing unsequenced regions were carried out using Taq polymerase with GC buffer (Takara LA Taq; Takara Bio Inc., Osaka, Japan) and specific primers complementary to sequences flanking the gaps. DNA walking annealing control primer technology (DNA Walking SpeedUp™ Kit; Seegene, Seoul, Korea) was also used to directly amplify unknown sequences adjacent to known sequences within a contig. PCR products were sequenced by cycle sequencing (Big-Dye Terminator Cycle Sequencing Kit v 3.1; Applied Biosystems, Foster City, CA, USA), except for a single gap in chromosome 10, which was filled by a sequencing reaction performed using in vitro transcription (CUGA Sequencing Kit; Nippon Genetech Co., Ltd., Tokyo, Japan). PolyC-tailing and the anchor primer method, the inverse PCR method and the asymmetric PCR method were used for sequencing the ends of chromosomes. For details, see Additional files 1 and 2. Assembling of sequence data and two strategies for gene prediction have been described previously . To determine the complete sequences of the histone cluster area in the C. merolae genome, we carried out NotI and ApaI subcloning of the BAC clone GESZ2-b20, which included possible histone clusters in chromosome 14 . Restriction-enzyme analysis, Southern blot analysis with histone-related probes and end sequencing of the subclones revealed relative positions of the subclones on chromosome 14 (Figure 2). Six gaps between contigs/fragments in the histone cluster area  were filled using primer walking of the subclones. For details, see Additional files 1 and 4. The 100% chromosome sequences are accessible under the DDBJ with accession numbers AP006483–AP006502 (chromosome 1–20). Sequences and annotation are available at http://merolae.biol.s.u-tokyo.ac.jp/. We thank Professor D. L. Kirk (Washington University) for critically reading the manuscript. This work was supported by Grant-in-Aid for Creative Scientific Research (No. 16GS0304 to KanT, NS and HN) and Grant-in-Aid for Scientific Research (No. 17370087 to HN), from the Ministry of Education, Culture, Sports, Science and Technology of Japan; and by grants from Frontier Project "Adaptation and Evolution of Extremophile" (to TK) from the Ministry of Education, Culture, Sports, Science and Technology of Japan, and from the Program for the Promotion of Basic Research Activities for Innovative Biosciences (PROBRAIN to TK). HN, OM, KN, FY, YY, TF, SN, HK and TK performed filling contig gaps. HT, SM, KatT, SJC and KanT determined the chromosomal ends. KiT and NS completed the histone cluster area. MM and OM assembled the sequence data. ST analysed the transposable elements. All authors discussed the results and commented on the manuscript.